The storms continue, grey clouds sweeping the landscape, driven by cold, skin shrivelling winds. Snow last night, today, tonight. 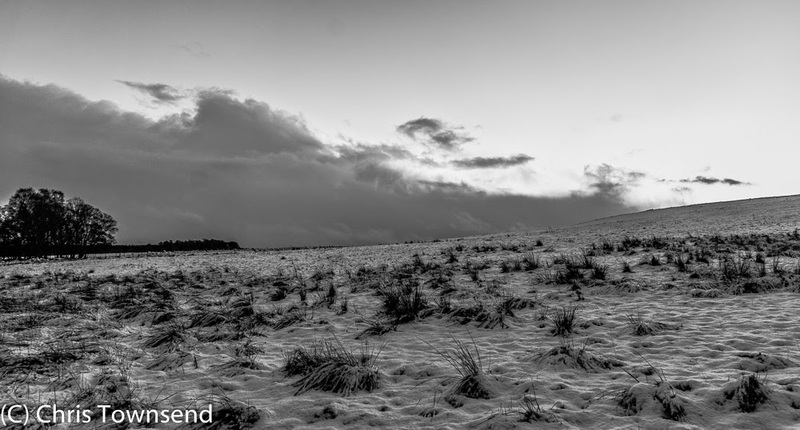 A monochrome landscape with barely a touch of blue in the sky between the clouds. The hills hidden, the woods stark and silent, the meadows rippled with snow, half-buried grasses bending with the wind. The forecasts say it will continue, up to and over Christmas, another week at least of storm after storm. More snow tomorrow, then a big thaw, as we had two days ago, for just one day before the snow returns. That actually made me feel chilly. Wonderful stuff. I hope you're right Alex but I think winter is going to have to start all over again. Heavy rain and a huge thaw today at all levels. The snow is vanishing rapidly. There could well be. At present it's snowing then thawing every few days. More snow forecast for the 25th, then a thaw again on the 27th. Great photos as usual Chris. Climate change is definitely happening. I think the winter skills courses at Glenmore Lodge used to run from November-April. Now its just a few weeks around February. Its the same story in the Pyrenees and Alps, weather all over the place; chaos. I hope there is some good snow this winter. I was on a course at Glenmore Lodge a few years ago and the snow/weather were Alpine conditions and our instructor on that particular day said "today, let's just go out and enjoy it because the conditions don't get any better than this". It was stunning and we were all whooping with joy.